Four fresh steak buns. Crusty on the outside – very moist on the inside. Does anyone remember the episode of the British comedy "Keeping Up Appearances"
where Hyacinth rings the bakery to place a large delivery order for cream cakes? Sometimes I do crazy things, especially concerning food (but not exclusively, much to my chagrin). I think I have some kind of mental imbalance when it comes to cooking. Everything I look at I try to figure out if its possible to do better/cheaper/both at home. I think it’s my way of wanting to take some semblance of control over my life. Isn't this the wee-est bit of bread dough you ever saw? That’s probably a trait that will come in handy in the future. Money seems to always need to be stretched further; there's never more to spend. To change that would take a substantial gamble and shift. A crazy shift. But am I crazy enough? Well, I believe I’m on my way. I made four steak buns the other day. Just four. Not six, not eight, not twelve... four. From scratch. For dinner. There’s only two of us here (three if you count Henry our dog) and I had a hankering for some steak and caramelized onions. But I was too cheap to buy a package of eight steak buns. Why buy eight buns when we would only use four? One man's resourcefulness is another man's crazy. Maybe I am crazy... crazy like a fox. 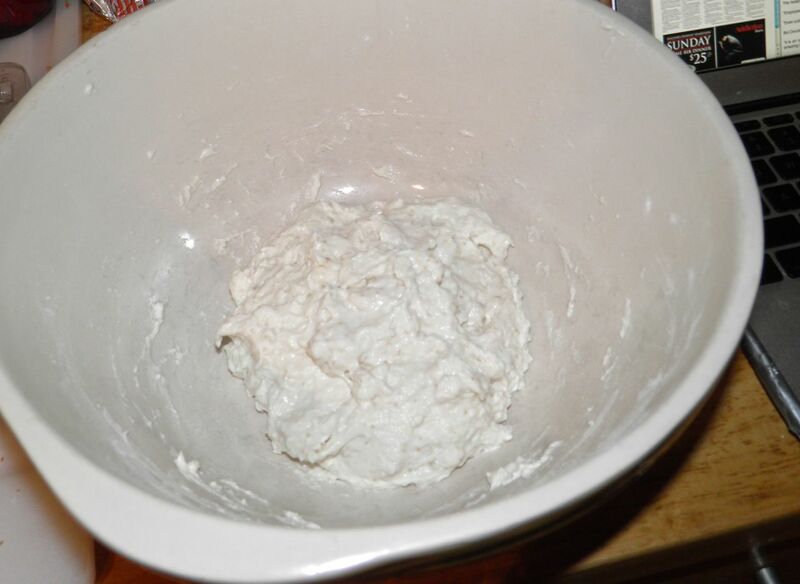 Making a lot of bread is no more difficult than making a little. 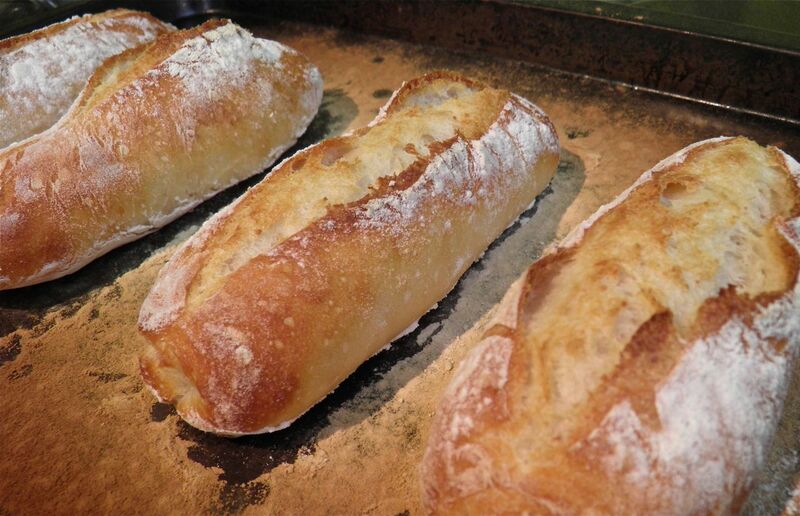 What does it take to make bread after all? Mix some stuff together, put it somewhere warm and then forget it for several hours. My recipe, since it autolyses, takes no kneading either. Bonus. 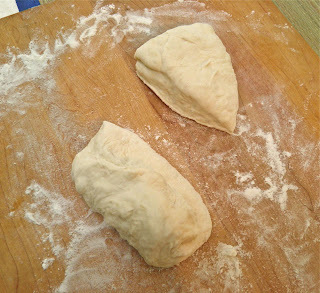 dough will take on a cylinder shape. Make then 6" long. You really can’t substitute other buns for steak buns. Steak buns are special. They are cylinders, and have a slit down the centre. This reduces vertical rise when they're baked, and gives them more flat surface when they are cut open. More room to pile on filling! I learned how important that slit was the hard way. One of my buns wasn’t completely cut down the whole length, and it bulbed out in a very unbecoming way. So next time I’ll make sure that my slit is the whole way down the length. It doesn’t mean you have to gut the buns, but a good quarter inch deep slit is a nice depth. The most effective way to do this (I find) is with a razor blade. You can get them loose (not attached to a razor) at Canadian Tire. Buy a pack, especially if you plan on making bread. They’re as important as baking pans. they're put aside to rest. Mix all the ingredients together in a large bowl. Cover with plastic wrap and then a dish towel. Place in a warm spot and let rise for 4 hours. At the end of the time the mixture will be quite frothy. Turn out onto a floured board and cut into eight equal pieces. Take each piece and shape into a bun by folding it over itself. As you fold, the roll will continue to get longer. Continue until they're about 6" long. Place on a floured (or parchment lined) baking sheet. 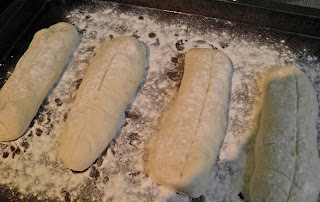 Dust with flour and let rise for an additional 30 minutes. Preheat oven to 450°F with a pan of water in the bottom. Just before baking make a slit down the top of each roll along the length. Bake for 25 minutes until crusty and brown. Remove the pan of water after the first 10 minutes for the crust to crisp. * It is said that only sane people think they're crazy. If you're nuts you don't think anything is wrong.